Any idea why my New USB 3 Memory Stick is so slow? Forums › Desktop computing › Any idea why my New USB 3 Memory Stick is so slow? 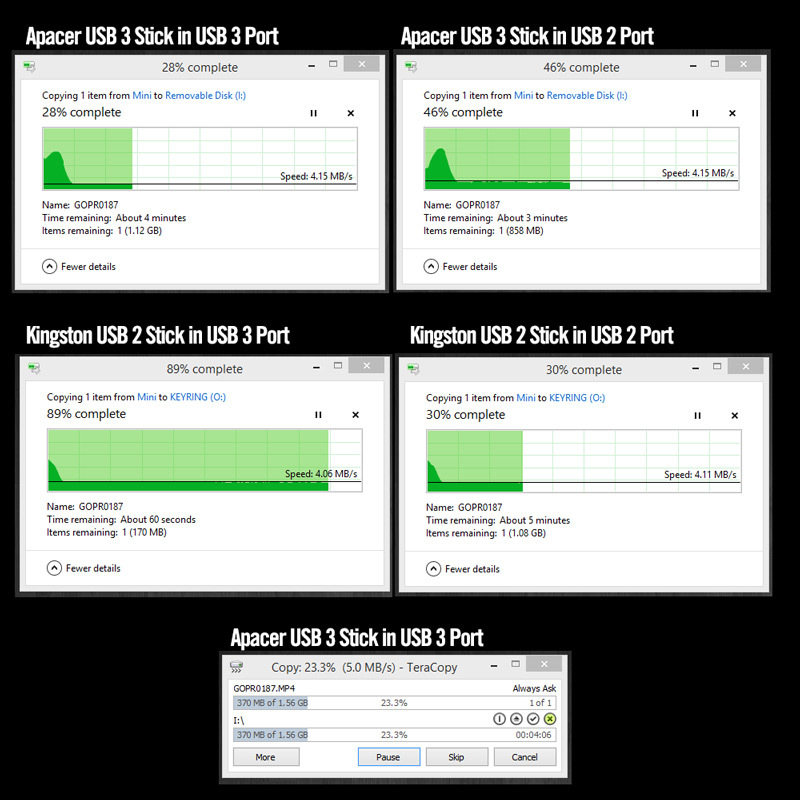 I just bought a new Apacer USB 3.0 memory stick over the weekend after putting up with (what I thought) were horribly slow USB 2.0 stick for the last few years, yet when I went to use it, there was really no improvement at all. After reading in the forums that some people were getting good results from Teracopy, I tried that also. I got a slight boost but still no where near what I was hoping for. I'm using Windows 8.1 and the stick is formatted to FAT32 (I copy between my PC and Macbook quite a bit). Anyone got any idea what's going on or how I could improve it? It could be a lot of things, but I also noticed my Sony USB 3 is no faster on a USB 3 port than on a USB 2 port. To compare, if I plug an external case with a 256GB SSD drive to my USB 3 port it just flies. Just because it's USB3 doesn't mean the flash it uses is any faster. That said, Apacer tend to be pretty decent. What sort of read speeds do you get? Is whatever the copy source is on capable of speeds greater than ~5MB/sec? I just did a copy to/from my Apacer AH352 16GB and got a bit over 40MB/sec for write and jsut under 50MB/sec for read. Do you have other USB3 devices that operate at full speed on those ports? Generally on modern pc's they are included in the intel chipsets but in older mobo's usb3.0 was an add-on and you needed 3rd party drivers. Might be wrong, but i 'think' this was the situation. I reckon your bottleneck is likely that the flash mem is just slow. eg, i bought a cheap as chips sandisk 95MB/s SDHC card from amazon , and a good quality lexar usb3.0 card reader.... the real world write / read speed is 60/70MB/s. on my HP probook I had heaps of trouble with USB 3 drivers doing what they meant to. also took about 3-4 USB bubs to find one with better firmware that finally worked. might not be latest.. latest I think had issues and rolled back. Just because it is USB3.0 doesn't mean it will be any faster. There are different speeds of the actual flash memory chips inside the device and this is what matters. Most, if not all, brands have different price levels for their USB sticks, the cheap ones will use slow flash memory while the more expensive models will be faster. You should be able to find the specs of your flash drive on the Apacer website. The speed can also depend on the size of the storage of the flash drive. Inphinity: Just because it's USB3 doesn't mean the flash it uses is any faster. That said, Apacer tend to be pretty decent. What sort of read speeds do you get? Is whatever the copy source is on capable of speeds greater than ~5MB/sec? I just did a copy to/from my Apacer AH352 16GB and got a bit over 40MB/sec for write and jsut under 50MB/sec for read. That's encouraging, my stick is also an Apacer AH352 16GB. I have a ASUS H87M-Pro Intel H87 MB which supposidly is Windows 8.1 compatable and has a USB 3.0 Boost that is supposed to enable 170% faster transfer speeds than traditional USB 3.0. I was copying from an internal SSD too so that shouldn't have provided any issues. so looks like it could possibly be a usb 3.0 driver issue - I haven't yet been able find a USB driver on the ASUS site that is compatable with anything later than windows 7. The southbridge controls the USB/SATA on the 87 range it seems. Do you have the manufacturers specs so you know what you are aiming for? To benchmark the drives against the manufacturers spec you should also use low level formatting software that is available from from the manufacturers. Were you writing large or small files? Smaller files take have proportionately more overhead particularly if write amplification is involved where whole blocks are rewritten for smaller amounts of data. Write speeds are typically slower than reads so have you also looked at read speeds for large files? That is more likely to indicate the actual speed. On my USB 2 flash drives average reads are six times faster than writes. The memory might be faster but the memory controller might be more limited. my 64gb apacer usb 3 sticks run at 80-100MB/s in a laptop with a usb3 port and when copying to an SSD disk. when copying to the sata disk its more like 50-80MB/sec. Because when people go shopping for USB memory sticks, they tend to look at "how many GB for how many $$$$" and very little else (sometimes a nice colour helps). Flash memory makers know this. alexx: Because when people go shopping for USB memory sticks, they tend to look at "how many GB for how many $$$$" and very little else (sometimes a nice colour helps). Flash memory makers know this. Yeah I kind of agree with that, but I still think I should still be getting much greater speeds than I am getting presently. Will try some of the suggestions out when I get home later tonight. Oblivian: The southbridge controls the USB/SATA on the 87 range it seems. Is it actually connecting as USB3? USB3 uses different connectors and if they're not making a connection because they're damaged or dirty, it'll be using the USB2 connections. My apologies, every value I gave should have been MB/s. The stick is appearing as a USB3.0 FLASH DRIVE and both the memory stick and my PC are quite new and shouldn't be dirty or have any damage. I tried the stick on a 2013 Macbook with USB3 and i was still only getting a write speed of 5.3MB/s so looks like it's the stick that's the problem.